It’s finally starting to feel like winter around here and that has me craving a hearty bowl of soup. I do love to cook, and in a former life I would spend countless hours in the kitchen. Fast forward to my current life: evenings are often so busy that I have only 20-30 minutes to get dinner on the table. 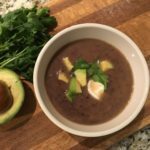 Super quick black bean soup to the rescue. This recipe only has 5 basic ingredients and you can make it start to finish in 15 minutes. Best of all, you can keep all the basic ingredients in your pantry, allowing you to whip up this soup without a trip to the grocery store. You can customize it with an assortment of garnishes. I love mine with a dollop of 2% greek yogurt, chopped avocado, cilantro and a squeeze of fresh lime juice. Nutritionally, this soup is your friend too. Thanks to the black beans, it’s full of fiber and vegetarian protein. 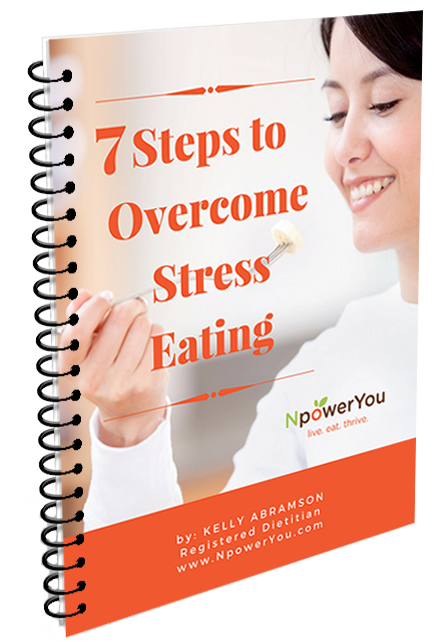 Add a salad and some cornbread or crackers, and you have an inexpensive, quick and healthy dinner. Ingredient notes: I specify lower sodium canned beans and stock in the recipe because regular versions are too salty. It's better to use the lower sodium items and adjust seasoning to your taste near the end of cooking time. Heat olive oil in a 4 quart saucepan until it starts to shimmer. Add salsa to pan and cook until it bubbles and becomes fragrant, approximately 3 minutes. Add beans and stock to pan. Bring to a boil. Reduce heat and simmer for 10 minutes. Using an immersion blender, puree soup in the saucepan until it is smooth. Some small bits of beans may remain. You can also use a regular blender, but you will need to blend the soup in batches. Hot soup will expand in the blender, so never fill it more than halfway. Add salt to taste and stir to blend. Ladle into bowls and top with garnishes, if desired. Enjoy!